DisplayAlerts Application Property in VBA has Boolean value either True or False. Default value is True. When the value is True it displays alerts and messages while running a macro. If the value is False it doesn’t display any messages or alerts. Please find the more information and syntax in the following chapter. Here syntax for DisplayAlerts Property of application object in VBA. In the above syntax Application represents object and DisplayAlerts is the Property of Application object. 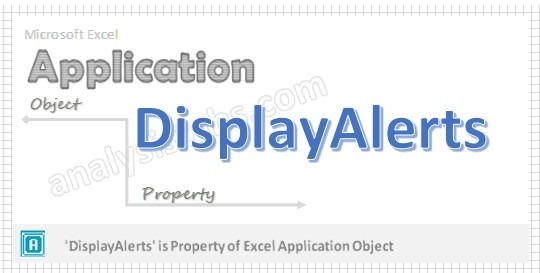 Please find the below example for DisplayAlerts Property of application object in excel VBA. The below example doesn’t display any alert while closing active workbook. Please find the below example for DisplayAlerts Property of application object in excel VBA. The below example displays alerts while closing active Workbook.